I confess that reviewing plays and musicals for decades can leave one feeling a bit jaded. But now and then even a critic who thinks he’s seen it all can stumble into a show that utterly restores his faith in theater. And so it is with “Newsies,” the ebullient co-production marking the first collaboration between the Coterie Theatre, the professional young-audiences company based at Crown Center, and the White Theatre, the handsomely fitted playhouse that is part of the Jewish Community Center of Greater Kansas City. The big cast includes seasoned adults, college students and middle-schoolers but their collective dedication and love for the material is contagious. Their passion for performing makes this a singular experience. 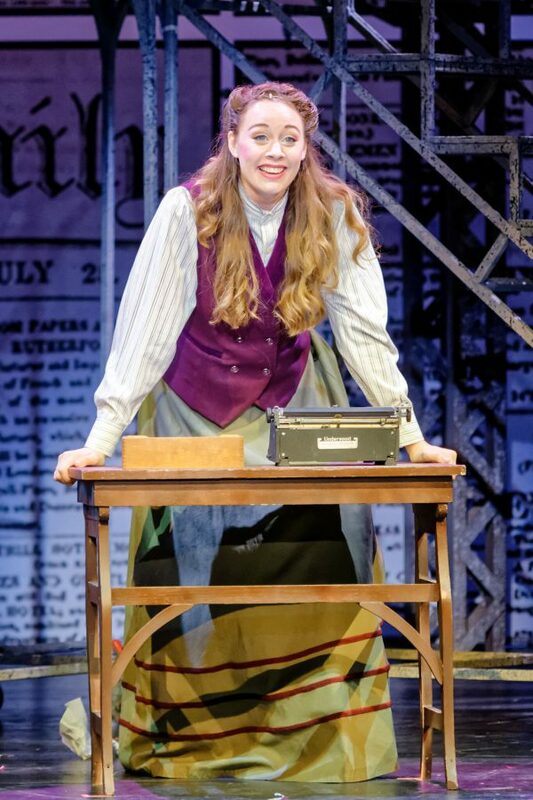 This 2012 musical, like the 1992 Disney movie it’s based on, is a highly fictionalized recounting of a real event: The New York newsboy strike of 1899 which challenged the cut-throat business practices of the city’s newspaper publishers, including Joseph Pulitzer. The real strike was triggered by a hike in the price the newsboys had to pay for the papers they sold on the street, and Pulitzer really was one of the “bad guys.” And, yes, the conflict was ultimately resolved by a compromise between the strikers and the publishers. 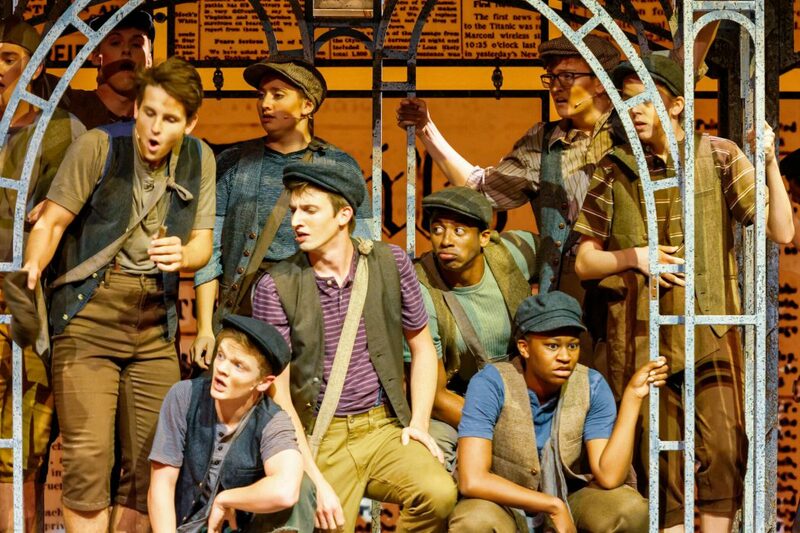 These bare facts are reflected in Harvey Fierstein’s book for this show, but for the most part “Newsies” is an exercise in Broadway make-believe that cares less about the actual events than in creating a feel-good show. Even so, “Newsies” contains some fundamental truths. This material has acquired remarkable relevance, almost as if it were written to reflect the current political climate. You have kids taking political action, not unlike the survivors of the Marjory Stoneman Douglas High School shooting in Parkland, Fla. The show also depicts one of the newsboys being packed off to the New York House of Refuge, depicted as a Dickensian house of deprivation, which naturally brings to mind images of children being held in detention cages in Texas. And, fairly or not, Pulitzer in this show is a villainous symbol of rapacious, unchecked capitalism. What makes this production special is the never-blinking commitment of a young cast who invest all they’ve got. The players reportedly rehearsed for four weeks and I believe it. The dancing in this show is awe-inspiring. Director/choreographer Jerry Jay Cranford creates sequences that require backflips, handstands, cartwheels and tumbling. Often the performers are airborne. And for good measure, Cranford includes an exciting tap number in Act II. The central character is the fictional Jack Kelly (Noah Lindquist), a talented artist who dreams of escaping New York for New Mexico and who becomes the strike leader. His boon companion is Crutchie (Lucas Lowry), a younger newsboy whose bum leg means he could be arrested and sent to the Refuge. As the strike gets underway, the boys are visited by a young reporter who introduces herself as Katherine Plumber (Kelly Urschel). She hopes to escape her role as a theater reviewer and features writer and establish herself as a “hard news” journalist. Quickly she becomes a champion for the strikers and a romance between Katherine and Jack blossoms. Early on the strikers are joined by two brothers from a middle-class home — Davey (Christoph Nevins) and his wise-cracking kid brother Les (played by Valen Jurkowski and Ben Renfrow at alternating performances.) Davey helps Jack figure out the challenges of forming a union and becomes an inspirational figure for the strikers. The technical credits — David McQuillen Robertson’s vivid scenic design, Jarrett Bertoncin’s atmospheric lighting, Julia Ras’s handsome costumes and Bill Christie’s props — are first-rate. The White Theatre may technically be a “community theater,” but most aspects of this production shimmer with professionalism. One measure of a good show is whether it sticks with you. This one does. To see this level of dedication from a company of actors, many of them in the early stages of their careers, is nothing less than inspiring. 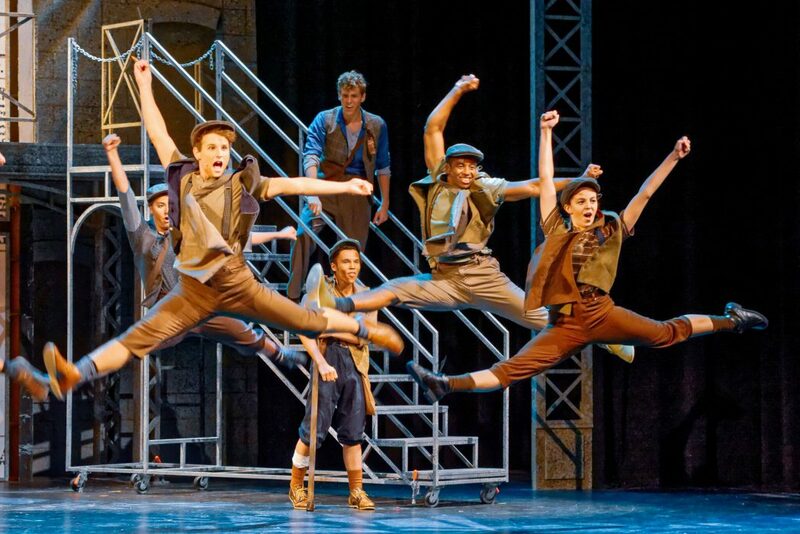 “Newsies” runs through July 29 at the White Theatre at the Jewish Community Center of Greater Kansas City, 5801 W 115th St, Overland Park. Call 913-327-8054 or visit https://thejkc.org.